Sports and diamonds. Why keep two good things apart? TAG Heuer proves there’s no need to separate sporty performance from luxury with the Tag Heuer Women’s Aquaracer Stainless Steel Diamond Watch WAF1415.BA0824. Care to blend active with exquisite? You can with this unique and adaptable timepiece. Polished stainless steel makes this watch glow in the day, and luminescent hands with a SuperLuminova star at 12 o’clock keep the time by night. A textured mother of pearl dial gives the watch face a slightly muted backdrop that brings out the Aquaracer’s 10 round diamonds. These jeweled accents mark each hour except 12 o’clock (where the numerals shine instead) and 3 o’clock (where the date displays). The polished, turning bezel is home to engraved numerals that don’t sidetrack the eye from this piece’s silvery grace. With a 27 mm case, the TAG Heuer Women’s Aquaracer Stainless Steel Diamond Watch WAF1415.BA0824 delivers the tested TAG Heuer brand and unprecedented craftsmanship. Top of the line Quartz movement and Sapphire crystal, held securely within a polished link bracelet, form the foundation of this exceptional piece. Inspired by the aquatic world, this timepiece glistens like sun on water, and will accompany you underwater to 300-meter depths. On land, you can use this watch with both formal and casual attire. If you’re looking for a watch that communicates luxury without the sportier elements, browse TAG Heuer’s Monaco collection. For $3,000 up, this collection merges designer straps made with fine alligator or python leather with square, diamond-encrusted dials and bezels. For the sleeker simplicity of diamonds and steel, with the elements of a sports watch discreetly embedded, stay with the TAG Heuer Aquaracer at $2,500. For a subtle sports watch that communicates overall elegance, the TAG Heuer Women’s Aquaracer Stainless Steel Diamond Watch WAF1415.BA0824 is no less than a champion. For a winning price, check online retailers, who offer this timepiece far below retail, at $1,550. 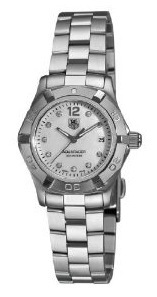 For that price, why not merge the TAG Heuer legacy with style, design, and performance.